Israeli Prime Minister Benjamin Netanyahu and his wife, Sara, rolled out the red carpet for President Donald Trump and first lady Melania Trump at Ben Gurion International Airport Monday morning, but one moment stood out: a flick of the wrist seen around the world. 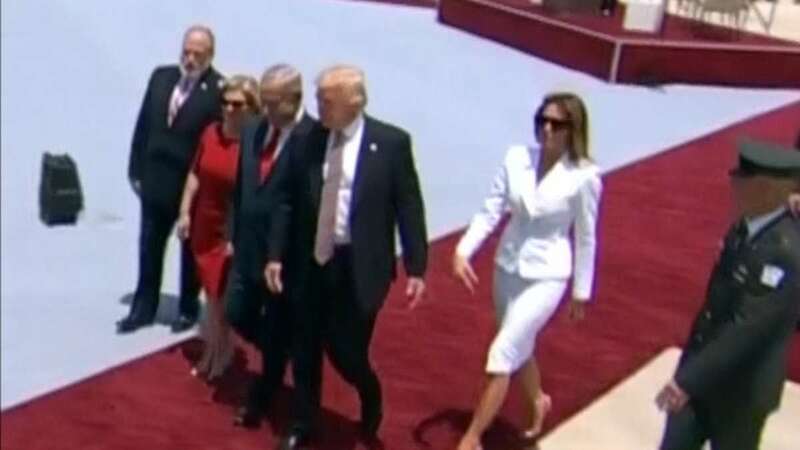 As the Trumps and the Netanyahus walked the red carpet following a formal welcoming ceremony and remarks, the President seems to reach for his wife’s hand. The first lady appears to swat her husband’s hand away with a visible flick of her wrist. The White House has not responded to CNN’s request for comment and context on the moment, but the video clip is already going viral. “Well this is embarrassing,” Israeli publication Haaretz wrote on its official Twitter account with a slow motion clip of the moment. The tweet has nearly 30,000 retweets as of this writing. That said, the Trumps have held hands multiple times during their foreign travels this week, including minutes later on the tarmac. They briefly held hands in Saudi Arabia as they entered the Global Center for Combating Extremist Ideology. And after the now-infamous swat, they arrived at the Church of the Holy Sepulchre hand in hand. It’s unclear what caused the swat, if anything. Perhaps the first lady, who studied extensively ahead of the trip, did not want to buck protocol, since their Israeli counterparts did not appear to be holding hands at that particular moment. Or maybe there was a bug. If it was indeed intentional, it’s not the first time the first lady has used body language publicly to steer her husband. She gently nudged him to place his hand on his heart as the national anthem played during the White House Easter Egg Roll last month. There had already been some confusion as the two couples walked the carpet ahead of the ceremony. “They have all this protocol, we never know what to do,” Netanyahu joked. “What is the protocol? Do you have any idea?” Trump asked. “Who knows!” Netanyahu said, laughing.